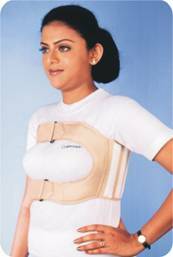 Lower Rib Support, Rib Cage Support for female, Rib Support, Rib Cage Support, Rib Support for female, Orthopedic Support for Rib. Constructed from lightweight and durable foam laminated fabric mesh. Specially contoured design for female covers 3" wide at front and 6" wide area at back for a comfortable and improved fit. 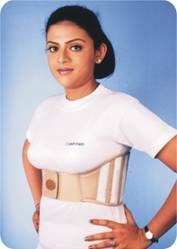 Removable splints at sides for adequate compression to lower ribcage. Designed to fix from front as well as from back provides wider adjustment and wearing comfort. Soft padding at back for support and to avoid irritation. Limits sudden expansion of rib cage following surgery and fracture by providing adequate compression. Allows comfortable breathing helps reducing pain and promotes healing. To order correct size, measure circumference of the chest at the base of the breast bone. Specially contoured design for female with oval opening in front covers 10" wide area and 6" at back for a comfortable and improved fit. Removable splints at sides for adequate compression to full ribcage. Designed to fix from front as well as from back, provides wider adjustment and wearing comfort. Allows comfortable breathing, helps reducing pain and promotes healing. Copyright © 2000-2014 Sabarindia.com All Right Reserved.